I’m sure all of us have been in a situation where right after cleaning the kids bedroom you find yourself wondering why is it that even though you just finished tiding it, it just doesn’t look right. After some thought you realize that it’s the dirty clothes basket laying on the floor with the dirty underwear sticking out of it that just ruins the whole job- laundry basket overflowing and the top nowhere to be found. Well, guess what, the solution to this common problem lays on a simple device that costs very little and you can pick up at any hardware store or even make it yourself. A wall hook and a medium to large dirty laundry bag is all we need to remedy this unsightly situation and save space at the same time. Direct your efforts to a hardware store such as Home depot and go to the hardware section. There you will find a variety of hooks for all purposes, light, medium and heavy duty. For this project, try to choose a medium to heavy duty hook that supports at least thirty-five to fifty pounds as this is where the laundry bag full of clothes is going to rest. 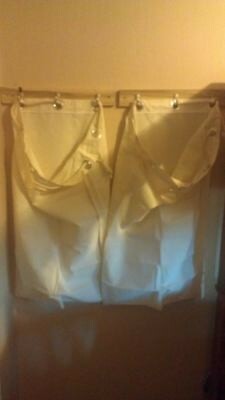 A dirty laundry bag measuring two by three feet with grommets (hooks will go in two or three of the grommets) is perfect and you can find them online. Try to install two hooks side to side to accommodate the underwear in one bag and color clothes in the other. If you are handy and prefer to make a custom wall hook yourself, H.D. will have all you need to make your gadget. Just go to the lumber section and ask an associate to help you find a 3”x.75”x18” Poplar or Redwood piece of wood (they’ll be happy to cut it to size for you). In the hardware section they carry a different mix of size hooks that come 6 to a pack normally, pick the one you like as well as some wood screws long enough to penetrate the .75 piece of wood, sheetrock and the 2×4 behind it, a 2” screw is all you need and shorter screws to attach hooks six inches apart (start at center) to the base. Finally, just drill the two holes 16 inches apart (again take the measurement from center and measure eight inches to either side) that will hold your creation to the 2×4 studs. Painting the base is optional and a good idea if you desire to accentuate and make your piece come alive. After finishing this simple task your kids will appreciate it and you’ll feel like a million dollars…good luck. © Pro-Team Cleaning & Janitorial All rights reserved. Web Design by Rambina.